Gm4lin version 1.2.11 is out ! Several improvements in the "plug and forget" philosophy ! Gm4lin version 1.2.9 was VERY buggy. I'm sorry for such a bad release, please upgrade to 1.2.9_2 asap ! You're using gm4lin.... send me an email to tell me how you use it, what you find usefull, what you find missing, ... ! Now gm4lin works also on Mac Os X (instructions are in the tarball for using the USB version on OSX) !! Download it now and try it ! 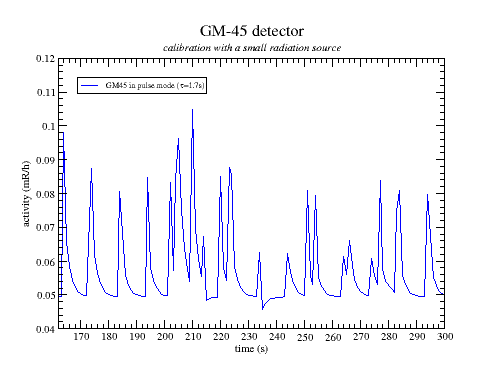 The goal of that software is to enable people to use the GM-45 or the GM-10 radiation detectors manufactured by Black Cat Systems under Linux (the GM-10 should work fine, but the calibration needs to be checked for that one). That detector connects to the computer using the serial interface. More informations about the detector can be found on http://www.blackcatsystems.com or on LND Inc. (LND Inc. is the maker of the chamber ref 7317 used in the GM-45 detector). Currently, this is a C program which is able to read data from virtually any number of these detectors (sensitivity can be selected individually, per detector) and output it to the screen, to a file or to a MySQL database. It can record the number or particules going through the detector's chamber per minutes or simulate the analog needle of a Bicron RSO-50E detector (each particule produces a little signal, with an exponential decay). Here! Current version is 1.2.15 (updated 04/14/11). Download a version (source code and compiled binary for Pentium processors) by clicking on the version number in the table below. For more informations, you can have a look at the README file, the ChangeLog and the TODO file. You can check my gpg public key on pgp.mit.edu or blackhole.pca.dfn.de. Otherwise, you can send me an e-mail asking for that key. If you have any problems with pselect unavailable on your system, comment out the lines about it in the Makefile and recompile. In order to enable gettext (for internationalization), uncomment the lines about it in the Makefile and recompile. In order to enable DEBUG mode, uncomment the lines about it in the Makefile and recompile. and if it still doesn't work, drop me a line! Home Page - feed the robots (in French)! - Same kind of antispam (Wpoison) in English - No e-patents !